From Virginia Tech: Virginia Tech President Emeritus Charles William Steger Jr., who led Virginia Tech through a period of unprecedented growth and historic transformation into one of the nation’s leading research universities, died Sunday evening, May 6, at his home in Blacksburg, Virginia. He was 70. Serving as the university’s 15th president from 2000 to 2014, Steger was entirely committed to the institution where he received three degrees and spent nearly all of his more than 40-year professional career. He is regarded as one of Virginia Tech’s most influential presidents in its 146-year history, having led the institution amid drastic reductions in state funding for public higher education and the unimaginable tragedy of April 16, 2007. Others who worked closely with Steger shared their condolences. During Steger’s presidential tenure, Virginia Tech grew in enrollment from 28,000 to 31,000, increased graduate enrollment by 12 percent, raised more than $1 billion in private funding, formed a school of biomedical engineering, created a public-private school of medicine, joined the Atlantic Coast Conference (ACC), and constructed the Moss Arts Center and the Virginia Tech Research Center — Arlington as part of the largest building boom in university history. Under his leadership, Virginia Tech charted a course to become a top research university; a year after his retirement, the university’s research expenditures ranked 39th in the nation. During his presidency, Virginia Tech increased its total research expenditures from $192 million to more than $450 million. Steger’s ground-breaking partnership with Carilion Clinic led to the creation of the Virginia Tech Carilion School of Medicine and Research Institute, forming the fifth medical school in Virginia. The medical school, which graduated its first class in 2014, will fully integrate into Virginia Tech and become its ninth college on July 1. A hallmark of his administration was the realization of a 50-year dream for Hokie fans—entry into the Atlantic Coast Conference (ACC) in 2004. The university’s football program, led by Steger’s undergraduate Class of 1969 classmate Frank Beamer, won four conference titles in the first eight years of ACC play. Steger calmly guided the university when it lost almost 25 percent of its state funding in the early 2000s. He developed alternative business models and new funding streams, increased philanthropic support, and fostered innovative public-private partnerships, helping Virginia Tech not only adapt, but also thrive. He also championed efforts to grow Virginia Tech’s reputation for high-quality academic and research programs. With significant personal resolve, Steger led the university through its darkest days following the tragedy on April 16, 2007. Although the campus community suffered a tremendous collective trauma following the loss of 32 faculty members and students whose lives were taken, Steger’s steady hand of leadership inspired the university community to come together and recover, and the university became a model for organizational resilience. To enable Virginia Tech to react quickly to emerging intellectual trends, Steger embraced a business model that invested in seven large, centralized research institutes: Virginia Tech Transportation Institute; Institute for Critical Technology and Applied Science; Virginia Tech Carilion Research Institute; Virginia Bioinformatics Institute (now the Biocomplexity Institute at Virginia Tech); Fralin Life Sciences Institute; Institute for Society, Culture, and Environment; and the Institute for Creativity, Arts, and Technology. The institute format allowed the university to compete for and win large-scale multidisciplinary contracts. The university built 40 major buildings under Steger, adding more space during his tenure than that of any other president in the university’s history. Steger championed the arts while investing in the liberal arts and arts programming. In 2006, University Distinguished Professor Nikki Giovanni established the Steger Poetry Prize, a competition for Virginia Tech undergraduate students, and named it for its first benefactor. And Steger was the driving force behind the Moss Arts Center, which opened in 2013. Among the 40 buildings, two separately constructed parts of the facility that collectively house the Biocomplexity Institute of Virginia Tech today were named Steger Hall in 2016. Steger elevated the university’s presence in northern Virginia by establishing the university’s National Capital Region operations and building a state-of-the-art office and research facility in Arlington that opened in 2011. The strategic move signaled the university’s growing commitment to the region, which continues to this day. As dean of the College of Architecture and Urban Studies from 1981 to 1993, a post he assumed at the age of 33, Steger pushed the university to establish its first overseas campus, in Riva San Vitale, Switzerland. In recognition of his essential role in its creation, the facility was named the Steger Center for International Scholarship in 2014. A Fellow in the American Institute of Architects, Steger earned three Virginia Tech degrees: a bachelor’s degree in 1970 and a master’s degree in 1971, both in architecture; and a Ph.D. in environmental sciences and engineering in 1978. He left a private-sector career in 1976 to pursue his passion for teaching at Virginia Tech. 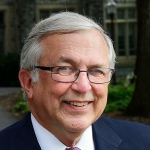 In addition to serving as a faculty member and a college dean, Steger also served as acting vice president for public service, and then vice president for development and university relations, before becoming president in 2000. He was a member of Virginia Tech’s Ut Prosim Society and Legacy Society. Following his retirement as president in 2014, Steger served as executive director of the Global Forum on Urban and Regional Resilience, which brings university researchers and partner organizations together to facilitate conversations about patterns and processes of urbanization and regional development, with a special emphasis on the long-term resilience of places and communities. Steger was named a 2013 Tech Titan by The Washingtonian magazine. He received the Michael P. Malone International Leadership Award from the Association of Public and Land-Grant Universities in 2010, and the Chief Executive Leadership Award from the Council for Advancement and Support of Education, District III, in 2009. The New Century Technology Council awarded him its 2004 Compass Award for visionary thinking and leadership in the field of information technology. Steger is survived by his wife of 48 years, Janet; a son, Christopher Baird Steger, and wife, Elizabeth Jeanne Schumann; and a son, David Charles Steger, and fiancée, Alison Nemeth. Steger is also survived by a brother, Keith G. Steger, and wife, Teresa, and their son, Aaron Steger; a sister, Linda McGrath, and husband, Michael, and their daughter, Andrea; and a sister, Jennifer Layton, and husband, Jim; and a brother-in-law, John Baird, and wife, Wendy Wark, and their three children. Condolences may be shared by emailing vtnews@vt.edu.